<numzero> - Inserts incrementing numbers with leading zeros. <num> - Inserts incrementing numbers. <name> - Inserts the original filename. <create> - Inserts the file's creation date. <mod> - Inserts the last date the file was modified. * These tags are only available for photos that contain EXIF metadata. Batch renaming in ImageReel is easy. The first step is to "tag" the images that you want to rename. 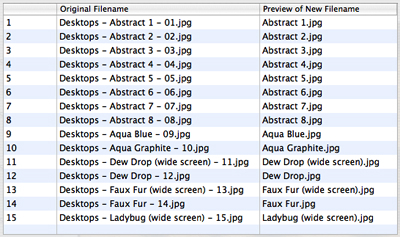 Then you can supply a new pattern for renaming the tagged images. The only requirement is that the pattern you come up with must give unique filenames. For instance, trying to rename 15 images "Desktops" won't be unique. But you can easily make them unique by adding incrementing numbers to the filename with a pattern such as "Desktops - <name> - <num>". A pattern like this would give you a result of "Desktops" followed by the file's original name and a number. Sometimes you may need to extract a portion of the original filename to use for renaming. You can do this in ImageReel by using regular expressions. Regular expressions let you create a pattern for matching characters in a string. For example, you can perform a batch rename and then go back and extract the old filename from the new names.